1 Master w/Queen, 1 w/Queen, 1 w/Double and Twin. Guest Linen Option. 3 CATVs, DVD. 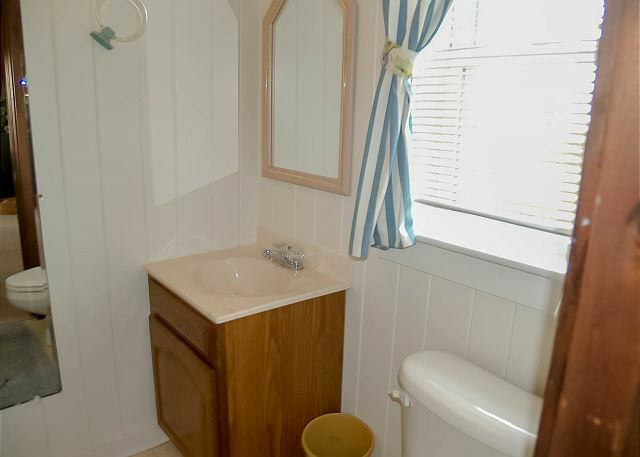 Other amenities include port-a-crib, books, board games, and clock radios. 30 yards to the beach. Milepost 3. Lower Level: Community Pool, 15 yards away. 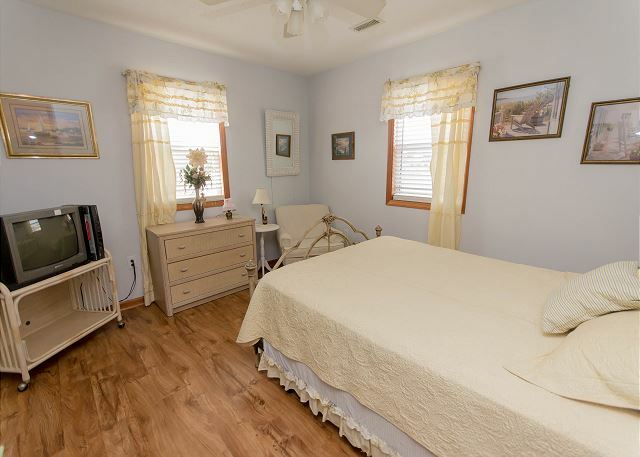 Queen Bedroom w/TV, Master Queen Bedroom w/TV, Double and Twin Bedroom w/TV, Hall Full Bathroom. 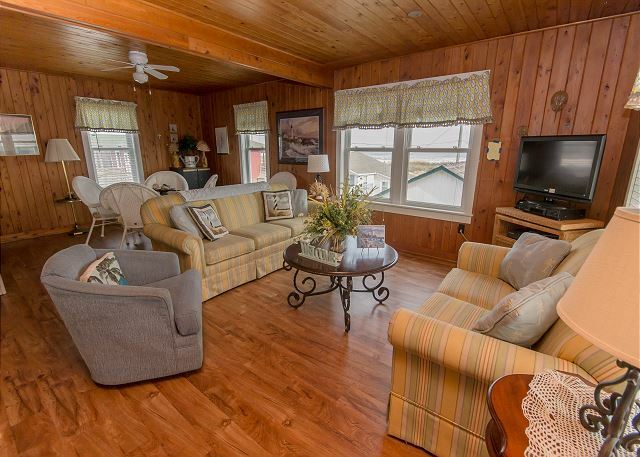 Upper Level: Living Room w/TV, Full Bathroom, Kitchen, Dining Area, Washer/Dryer Area, Outside Deck w/great Ocean Views. Thank you for taking the time to provide us feedback regarding your most recent stay. 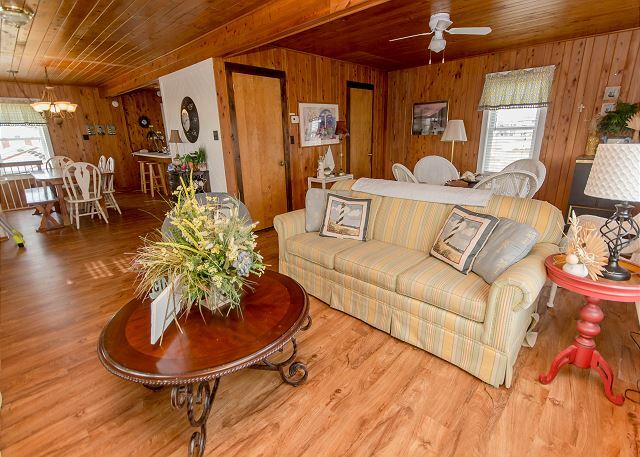 You can see the ocean from the dining room table, the living room, inside sitting area and the front porch. I loved it there! Great house, wonderful beach access. Only thing I wished it had was some more rugs/mats in the bathrooms and bedrooms. Thank you for taking the time to provide us feedback regarding your recent stay at "Atlantic Vu." We are thrilled to hear that you enjoyed your time spent here on the Outer Banks and the home you occupied in September! We will be sure to pass your feedback along to the Owner regarding some more rugs in the bathrooms & bedrooms. We hope to welcome you back to the Outer Banks again in the near future. Our rental home was lovely; incredible location, well kept, and so fun! Our vacation rental was very nice. Well kept. Plenty of room for everyone We had everything we needed for our stay. We were very pleased with the accommodations. Decent older home - easily sleeps 7-8 - a little dated but right on beach road across from beach access. associate was very helpful.gentlemen met and helped us find the location. wish the air conditioner worked better as 76 was too warm. one shower leaked and one didn't have much water pressure. Thank you for taking the time to provide us with your feedback about "Atlantic Vu." We are happy to hear that the service you received was helpful. We appreciate you bringing the water pressure to our attention. We will have this checked to ensure other guests do not have this same experience. 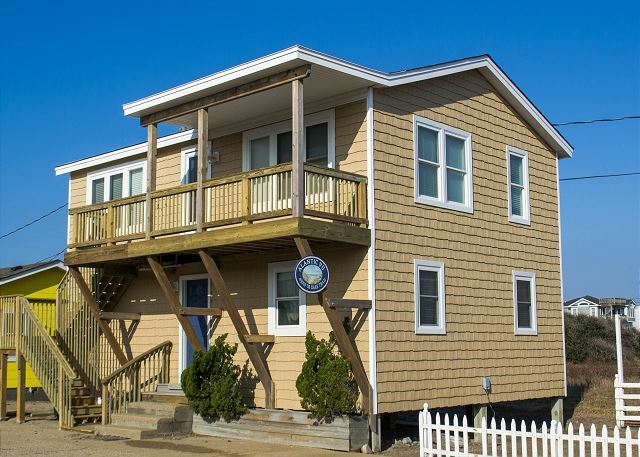 We look forward to welcoming your family back to the Outer Banks for many years to come. Nice experience in Kitty Hawk! A great experience....home was as advertised. Very clean. Great house to stay in, close to the beach and swimming pool. We all enjoyed staying in this house. The kitchen had everything you would need. Close to the beach and swimming pool. However the beds were sqeaky and the bedrooms and bathrooms were warm, no ventilation at all in the bathrooms, except a window. Pam, thank you for sharing your experience with us! Thank you for your feedback we will pass it along to the owner. We hope to see you again soon! We had a great week, this realty company is wonderful to work with. 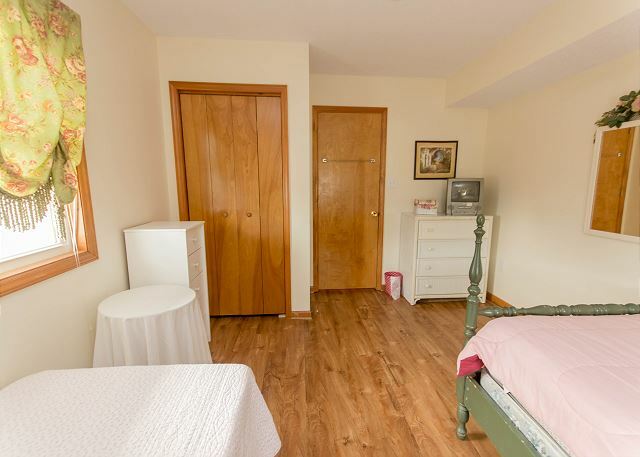 This house has the basics you need for a nice trip but the beds need updating. They are very noisy and the covers are very outdated. We were constantly waking each other by just rolling over. The shower curtain in the master really isn't functional. Wendy, thank you for sharing your feedback with us. We will pass the information about the beds along to the owner. We are sorry about that. We hope to see you again in 2018! It was a great week for my family, including our two girls (8 and 6) and dog. - Pretty clean home. I was expecting a pet smell since the house allowed dogs, but surprisingly the smell was not there. - Awesome location. Beach is literally across the street (3 minute walk lugging beach stuff). Also centrally located to major attractions. 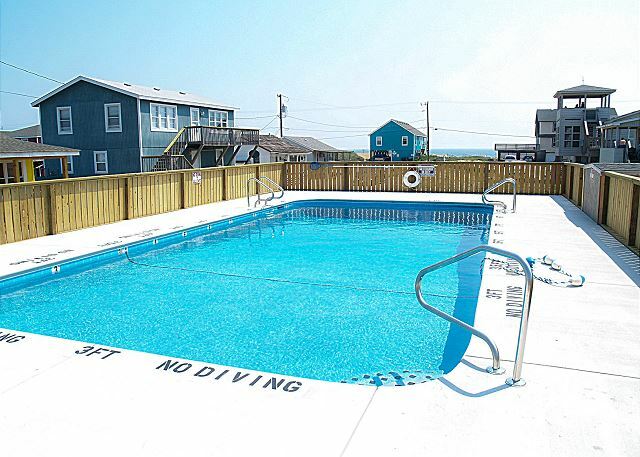 - Community pool is very convenient and clean as well. We usually used it later in the day (no shade) and had it to ourselves for the most part. - Could use some TLC. Vacuum was ineffective. Hose sprayer outside is broken. Shower curtain has black mold. Squeaky mattresses. - Grassy area outside has little picky things that got caught in the dog's paw pads and irritated them. Also got caught in shoe/sandle soles and got tracked into the house. Ouchs in bare feet. The house was in a great location. Having the pool so close was very convenient. The house was great for kids. Appreciated the extra details of the owner for the kids. There was a closet of toys and beach gear. The building blocks and construction paper allowed the adults some down time. We enjoyed our time away, as we always do. We will,however, next time stay in our most favorite location which is nags head. And rent a home with a pool. Had one of our best vacations ever! Right next to the pool, across the street from the beach. No crowds! Beach Vacation. We enjoyed the stay. Thank you for your review. The new furniture and flooring for this year have made this quaint home even more enjoyable. We hope to see you next year.